Over eight hours of video tutorials. 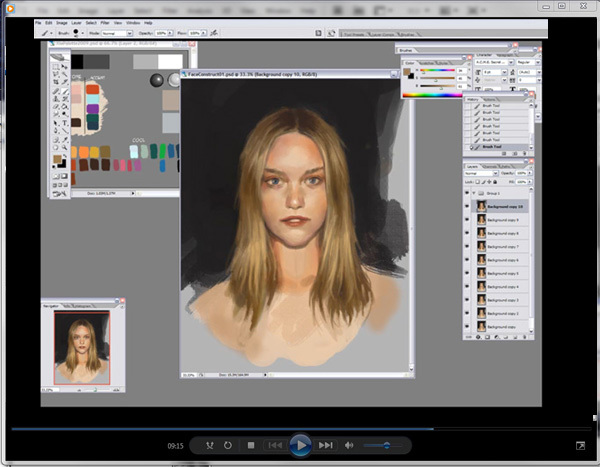 Digital painting tutorial pack 1: Painting female portraits. 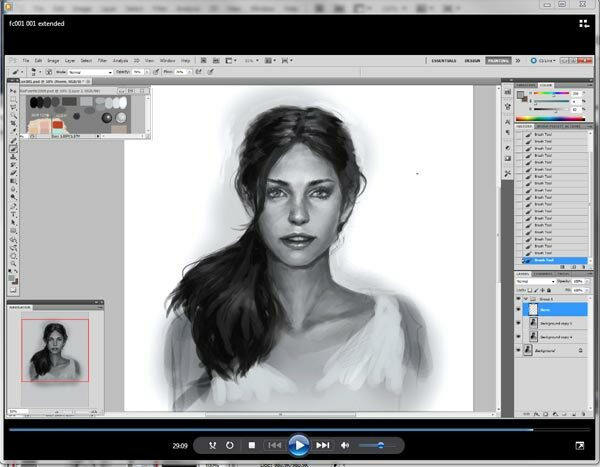 You will learn to draw and render female's portraits in Photoshop. You will learn how to Working with layers, tools, and brushes walk through. You will learn how to use Photoshop as extremely proficient painting tool. If you are new, my tutorial will make a HUGE improvement in your digital painting skill. Revealing Methods and Techniques that could not be shown in my free tutorials. 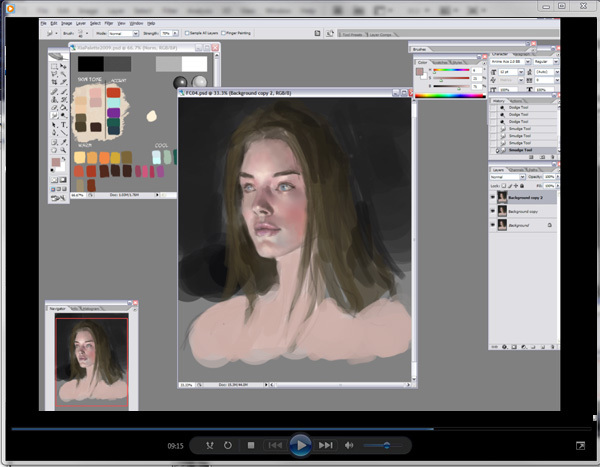 Digital painting tutorial pack 2: Painting female portraits 2. You will get approx 2 hours of Video tutorials, included 14 Chapters. You will learn the professional method of effectively painting female's portraits. You will learn to paint monochromatic foundation. You will learn to paint with color and palette..
You will learn to proficiently work with layers mode: Overlay, Multiply, Dodge, and Color. You will learn to use very useful and complex adjustment layer Functions to excel your painting. Format: MP4 files (approx: 1280 x 720). You will get over 2 hours of Video tutorials, included 10 Chapters. You will learn to draw and paint four different Male faces. You will learn to paint with monochrome and color. Digital painting tutorial pack 4: Painting hair. You will get over an hour of Video tutorials, included 5 Chapters. 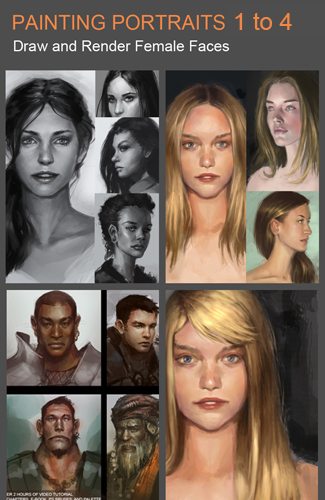 You will learn to paint hair in depth for concept and illustration within hours. You will learn to use light and shadow to create hair and shape. You will learn to to manipulate hard edge, soft edge and lost edge. You will learn to use adjusment layer mode functions to enhance your illustration. 01) Face construction using line drawing. 02) Establishing light and shadow. 03) Basic edges and dealing with hair. 04) Working with soft and hard edges. 05) Drawing face from 3/4 view. 07) Using values for shapes and forms. 08) Finsihing with custom brushes. 09) Drawing face from 3/4 view. 10) Arranging and manipulating shapes. 11) Render with value to get the form. 12) Manipulate simple values and edges using custom brushes. 13) Constructing face from side view. 01) Color palette explain in depth. 02) Establishing lines and blocking in values. 03) Skintones and color temporatures. 04) Painting face using color, balance cool and warm. 05) Painting hair and finishing up a portrait. 07) Establishing skintone and values. 08) Balancing soft edges and hard edges..
09) Painting dark hair and finishing up. 10) Three Quarter View Portrait painting. 11) Establishing values and finish up. 12) Arranging features, shapes and forms. 13) Blocking in, arranging colors and values. 14) How to paint skintone variations. 01) Construction lines and Block in Values. 02) Define Facial Structure using values. 04) Establishing 3/4 View Face. 06) Between cool and warm. 07) Establishing 3/4 View old man's face. 08) Apply color over values. 09) Face stylize and exaggerated. 01) Sketch rough hair style. 03) Define hair using light and shadow. 04) Add detail using edges and textures. 05) Additional tips for painting hair. 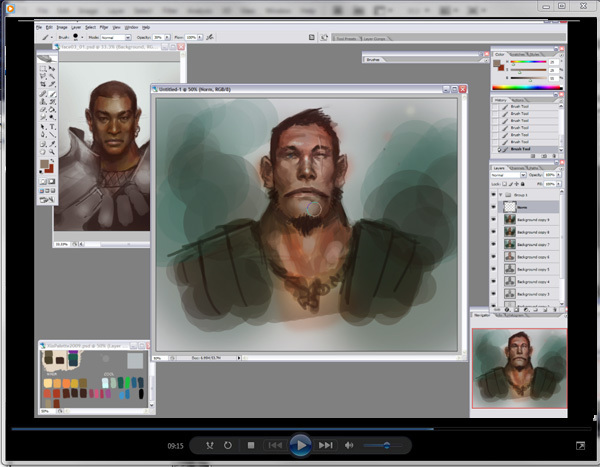 In this tutorial, you will learn the foundation of digital painting. Either you are new to or familiar with digital painting, this Premium Video Tutorial is your fast-track to take your skill to the next level. You will learn the Quick, Easy, and Effective method to create six female faces in FRONT, SIDE, and THREE QUARTER VIEWS. Then you will learn multiple ways to construct female head from very basic structure to fully render facial structure using either lines or values to achieve the final result. You will also learn how to manipulate shape and form within the value ranges to change it into any unique set of facial features. 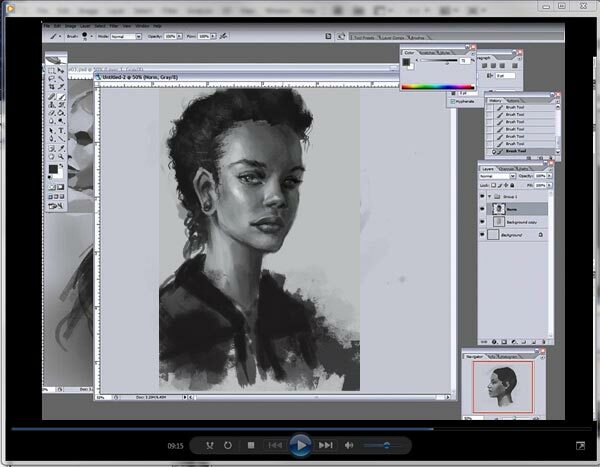 This tutorial will explain how to paint portraits or faces in variety of point of view and styles. You will also learn how to manipulate shape and form within the value ranges to change it into any unique set of facial features. Learn how to arrange skintones and balance color temporatures. Using cool and warm color as an effective tool to balance the portrait illustration. In this FEATURE TUTORIAL, you will learn to digitally paint female head (face) from three different face samples and be able to paint facial structures using eithercolor, values and shape to achieve the final result. Digital painting tutorial: Male portrait 3 -LEVEL: Beginners - Intermediates. 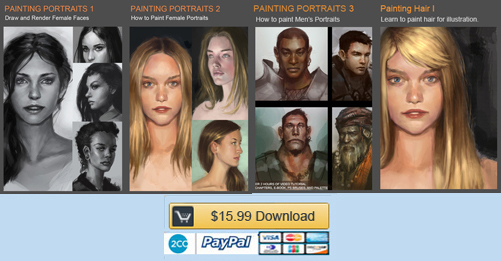 Finally, the tutorial will explain how to paint MEN's portraits or faces use in character concept design from idrawgirls? Yes, you heard it right! 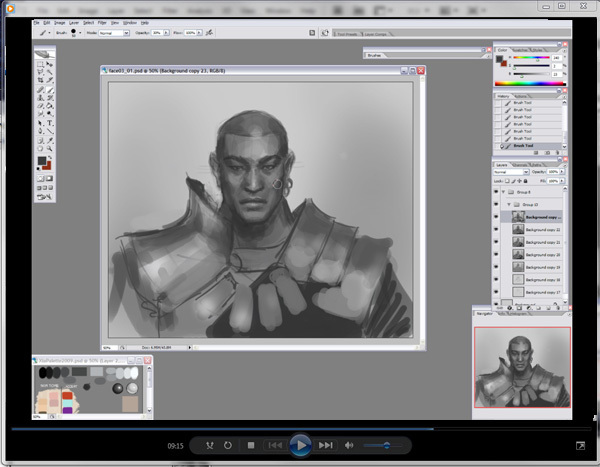 This tutorial will demonstrate how to draw and paint men's face in character concept design for games, animation, or illustration. Simple theories and ideas that will help you ease and excel your process when designing character concept. You will also learn how to manipulate shape and form within the value ranges to change it into any unique set of facial features. Learn how to arrange skintones and balance color temporatures. Using cool and warm color as an effective tool to balance the portrait illustration. In this FEATURE TUTORIAL, you will learn to digitally paint type cast male head (face) from four different faces samples and be able to paint facial structures using eithercolor, values and shape to achieve the final result. Digital painting tutorial: Hair -LEVEL: Beginners - Intermediates. This tutorial will explain how to paint hair, for mainly straight long hair. Also you will learn tips and technique on how to approach and paint curly and darker hair. You will also learn how to manipulate hair styles within the value ranges using light and shadow. In this FEATURE TUTORIAL, you will learn to digitally paint female's hair from scratch to refine painting in illustrated style.